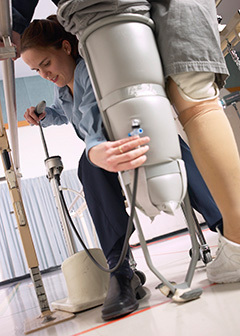 Quality Care Prosthetics & Orthotics is a full-service company that provides professional, high-quality custom prosthetic and orthotic services and has been helping patients for over twenty-five years. We are a passionate group truly dedicated to the care of our patients. We work with a large variety of patients of all ages with neurological, muscular and structural disorders. Many of our patients suffer from strokes, diabetes, and cancer. Over the twenty-five years we have been practicing, we understand how important it is to have properly fitting products that ensure comfort for our patients. We pride our practice on improving the lives of people with disabilities through the use of practical and easy to use Prosthetic and Orthotic appliances. At Quality Care, we use the highest quality materials with precision fitting and strive to have fast turnaround on all orders, including custom fabricated items. Our practitioners attend workshops and industry product seminars each year, allowing us to present our patients with the best array of products, resulting from the latest developments. We work with Physical Therapists, Nurse Practitioners, Physicians, Physician Assistants, Utilization Management, Family Members, and Care Providers to ensure our products meet each individual patient’s needs. We are available and happy to answer any questions or concerns regarding the fit, function, use, and care of the Prosthetic and Orthotic services we provide.